Special High Output Arm & Face Lamps - The Very Best Results! Receive the highest quality tan available! With special arm and face lamps, the Solar Wave 16RE and Family Leisure is a great choice for any residence! Tanners typically complain about the quality of a tan around the face and arms from beds, because the contours, peaks and valleys of these areas cause inconsistent results. This model tackles this problem, providing eight SunFusion lamps designed to effectively tan the face and arms. The standard Wolff lamps are effective and efficient as well, with energy-saving ballasts and reflectors. Be comfortable the next time you tan! Bring home private sessions and never pay a tanning salon again! 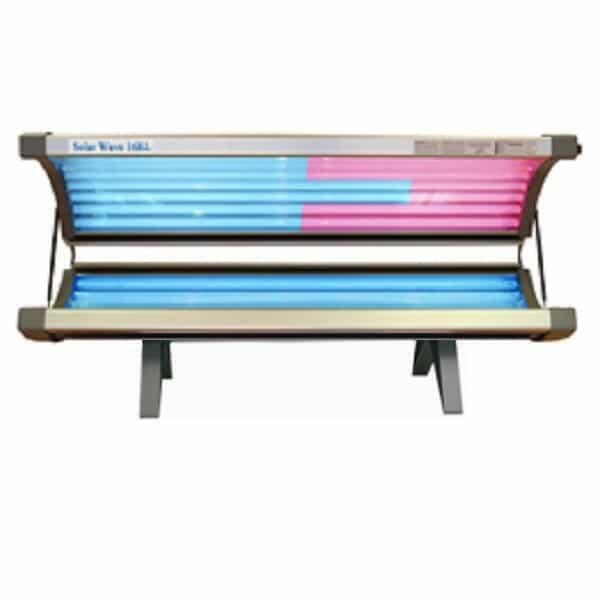 Bring home the Solar Wave 16RE Tanning Bed with Arm and Face Lamps, which arrives to your doorstep with free shipping nationwide from Family Leisure! Full Size: 76" x 32" x 48"
Large Tanning Surface: 29" x 71"
Shipping on tanning beds varies from three days to three weeks from time of purchase depending on inventory. Please call for current availability. This item requires freight delivery. This shipping method uses a full size semi-truck or box truck and product will be delivered to a street side location or into a driveway with lift gate access. It will contain 2 or 3 boxes, each weighing approximately 40-50lbs. Inside delivery and/or set-up is not available with this item. A representative will call to schedule your delivery which will require a signature upon receipt.